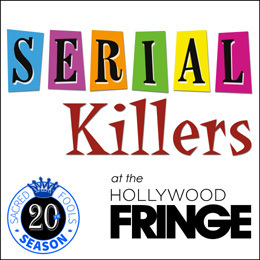 Hollywood Fringe - serial killers at the fringe. Serial Killers at the Fringe. The long running late-night hit from Sacred Fools, each show features world premiere episodes of continuing storylines. At the end of the show, you vote for the the stories that you would like to see continue onto the next show, where their subsequent episodes will then be pitted against competing storylines, until one storyline is crowned Fringe Champion. Each week’s serials could move closer to a championship… or be quietly smothered in their sleep – it’s up to you. But whichever pieces you vote for, one thing is for certain – by the end of the evening, you will be a Serial Killer. The following 8 1) pieces entering the fray for this Serial Killers Battle Royale during the fringe.. 8 will start but only 1 will win. Each Saturday you will get to kill 2 of the remaining contestants till you finally place a crown on our season 12 victor!